Do you ever get the feeling that you are busy, but not productive? This scenario is more common than any of us like to admit, when you have anxiety. It's a trap: busyness seems a good idea but could be covering up what you want to get done. You get up on a morning and think about your to-do list. There are lots of things on there. The house needs cleaning, the washing up needs doing, emails need answering, and most importantly, you need to make a phone call. "Not that phone call," we think to ourselves. Maybe it is not a phone call. Maybe it is writing a presentation for work, working on the blog you have always wanted to start, filling in a benefits form, completing a university assignment or making a cruical decision about your life. Whatever the task is, it is a high resistance one. It is something that you do not want to do. Why? Most likely, it takes thinking, decision making or making yourself feel uncomfortable. Doing so takes up a lot of mental energy. You know what happens next, right? The entire house gets cleaned, all the washing up gets done, every email in your inbox gets answered (except that email, that you know you should answer but do not want to, because it is a high resistance email) but that high resistance task on your to-do list does not get completed. It will have to wait until tomorrow. If you look at your day, it seems like you have been busy. You have been busy. You spend no time relaxing, no time looking after yourself; you spent it all doing chores. But, and this is the critical point, you were not productive. Emails and washing up can get done anytime: there was one thing you needed to do, and you did not do it. We should not spend time beating ourselves up about this. Spending time punishing yourself mentally will not help you get it done in the future. However, we do need to accept that these days do not count as productive. They are busy days but do not produce the results we want. This is very common for people with anxiety. At the root of anxiety is avoidance. If we were not avoiding any situations or thoughts, it seems plausible that our anxiety would not even bother us. It is the fact that it does cause us to avoid things that is the reason we find it so debilitating. As with most issues, the first thing we need to do is to spot what is going on. Tasks do not only have a level of importance; they also have a level of resistance. These can be entirely unrelated, though often there is a correlation between them: important tasks are often high resistance. If something has been pushed back on my to-do list for several days (or weeks! ), it is a good sign that I have a high resistance task on there that I have failed to acknowledge. The second thing we can do is to structure our day around them. You only have so much willpower. Therefore, rather than spending the entire day worrying about something and then not doing it, put it right at the start of your day. As the old saying goes, frog-eating comes first. 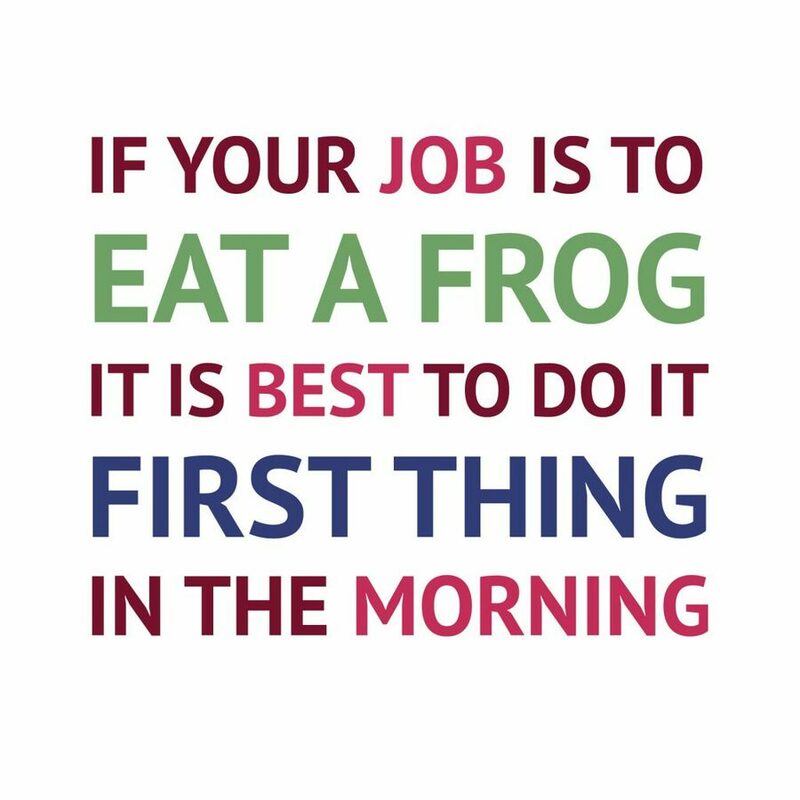 "If your job is to eat a frog, best to do it first thing in a morning. If your job is to eat two frogs, best start with the biggest one." If we do not force ourselves to get the task done, we will tell ourselves that we will do it later. The problem with this approach is 1) we spend the entire day with it on our mind and 2) as the day goes on, the amount of willpower we have available goes down. By the end of the day, we are tired and not in the mood to tackle hard tasks. Starting our day with the hard task means that we tackle it precisely when we have the most willpower available. Completing a hard task gives us a small release of dopamine which then makes us feel better for the rest of the day. So you should: you crossed that tough task of your to-do list! This quote is often attributed to Mark Twain, but it is unclear of its exact origins. It is easy to fool ourselves into thinking we are productive. Running around, crossing items off our to-do list makes us feel like we are getting somewhere. But are we working on the important tasks? That is the real measure of productivity. If not, we need to acknowledge that some tasks are much higher resistance than others, and try to tackle these as early in the day as possible. Published 6 March 2017. Written by Chris Worfolk.